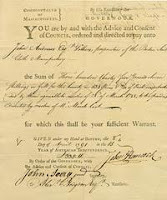 I’ve spent several evenings reading through the Revolutionary War pension application and supporting documents of my 4th great grandfather, Abiel Chandler this week. I originally ordered the documents from the National Archives and Records Administration (NARA) several years ago and dutifully logged them into my Clooz records database, put them in acid-free sleeves and then filed them in a storage binder. Unfortunately, even though I’d read the data in the pension documents, I must have become temporarily addled, because I hadn’t transcribed the family history related info they contain into my records. One of grandpa’s letters included the names, ages and occupations of his family members as well as their health conditions. This is great information! Why didn’t I extract it earlier? I think all of us are guilty of slipups like this. I often teach folks to spend part of their research time doing ‘data-mining’ in the records they already have in their possession. For some reason, we tend to become excited over finding a fact in a document and often leave nuggets lying on the floor as we hasten to record the new factual treasure. Our minds say, “I’ve recorded the information from that document” and we promptly file it away in an acid-free sleeve in an archival binder where it hands in the dark for months or years without seeing the light of day again. What prompted me to look for my filed copies of Abiel Chandler’s pension application again? I happened to be looking for something else on Footnote.com and while there saw the title of Revolutionary War Pensions listed and decided to go spelunking in that data cave. After searching for the records of several other ancestors who also fought in the Revolutionary War, I remembered grandpa Abiel and searched for his records. Bingo! There they were and they were much more readable than the photocopies I’d received from NARA years ago. I saved all 28 of them to my local machine and printed them out again. Obviously, I wanted the digital copies and new easier to read hard copies for my files. While still logged in to Footnote, I wrote a story page that included all of Abiel’s pension documents as well as four military pay receipts for him that were on the site. The story thus far is about ‘found’ data in records I already owned. Once again, I thought of the ease that I’d enjoyed finding Abiel’s records online. It was after midnight, while listening to some smooth jazz, in my PJ’s, drinking egg nog at home. Nice! If I’d ordered the same packet from NARA, the cost is $25 for the packet plus $15 for the handling and I’m sure I’m missing some costs now that NARA has substantially increased their fees. My cost for all the records on Footnote was an annual subscription of $59.95 (sometimes less if you watch the site for specials). Additionally, I’ve found Revolutionary War pension files for other ancestors on Footnote that I would have ordered a copy from NARA a year ago. Add the other records on the site that pertain to my ancestors, and the subscription price is a steal. The same is true for subscriptions to Ancestry, World Vital Records, and other similar sites. Do a free search on these subscription sites and see if you find records that pertain to your family. Calculate the cost to obtain the same data from the Family History Library or a library near you and then determine how quickly the expense of visiting the libraries eclipses a subscription to an online research site. If you are like me, the answer is one trip to the library and unlike the subscription website, when my day is over at the library, so are my research discoveries from their records. However, the subscriptions last all year long and I don’t have to fight the traffic on I-15. Smooth Jazz, PJ’s, egg nog. My family history research life is great! Happy Holidays! Tell your sweetheart you want a research site subscription for Christmas! It should be a regular practice to "revisit" old records. What may not have seemed importent at first could take on new light. I also go thru my collection of genealogy periodicals at least once a year, to see if any of the articles I didn't read in depth may now pertain to something I am researching.